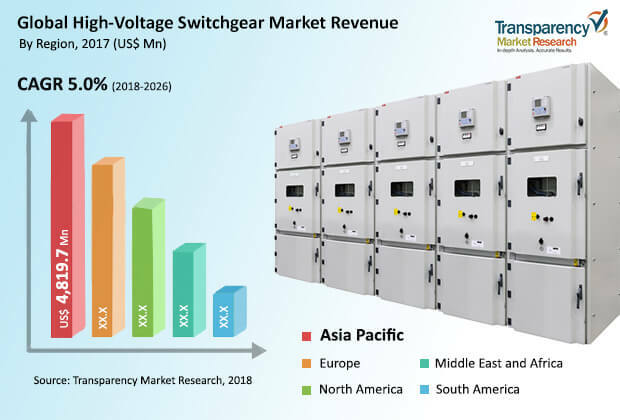 According to a new report published by Transparency Market Research, the global high-voltage switchgear market is projected to reach US$ 18,898.7 Mn by 2026, expanding at a CAGR of 5.0% from 2018 to 2026. The global market is expected to be influenced by a range of macroeconomic and industry-specific factors during the forecast period. Demand for high-voltage switchgear is likely to be significant in Asia Pacific from 2018 to 2026.The market in the region is anticipated to expand at a CAGR of 5.4% during the forecast period. Demand for high-voltage switchgear depends on expansion of the electricity transmission and distribution network. Hence, increase in government initiatives for the modernization of existing transmission and distribution network is expected to propel demand for high-voltage switchgears during the forecast period. The global high-voltage switchgear market has been segmented based on product standard, component, insulation, application, and region. In terms of product standard, the global market has been classified into IEC, ANSI, and Others. The ANSI segment is projected to account for the largest market share during the forecast period. The segment is driven by increase in adoption of ANSI standard electrical equipment. ANSI standard specifies sheet metal thickness, paint color, barriers, and other features to ensure consistency of equipment from various manufacturers. Based on component, the global high-voltage switchgear market has been categorized into circuit breakers, relays, and others. Demand for circuit breakers in developed as well as developing countries is driven by increasing electrification in countries in Asia Pacific and Africa. Circuit breakers is expected to be the largest segment during the forecast period. In terms of insulation, the global high-voltage switchgear market has been divided into air-insulated switchgears (AIS), gas-insulated switchgears (GIS), and others (oil and vacuum). Gas-insulated is expected to be the most preferred switchgear across the world. Air-insulated switchgears are expected to substitute gas-insulated switchgears in a few applications. However, gas-insulated switchgears have several benefits over air-insulated switchgears. The physical size and design of gas-insulated switchgears offer higher reliability and flexibility. Moreover, gas enclosed design makes GIS the most suitable solution for indoor and underground substations. The maintenance cost of GIS is also minimal, because the busbars and switching units are completely sealed, thereby limiting the need for insulation cleaning and user intervention. Usage of sulfur hexachloride (SF6) gas is expected to drive the GIS segment, as this gas has high dielectric property compared to air and acts as an insulating medium in high-voltage or extra high-voltage switchgear equipment. However, SF6 is a greenhouse gas and has a significant impact on global warming. It is one of the six gasses listed in the 1997 Kyoto Protocol designed to lower greenhouse gas emissions across the globe. Asia Pacific dominated the global high-voltage switchgear market in 2017, with China accounting for majority share of 30.2%. The region’s dominance of the global market is attributed to large population, increase in industrialization and urbanization, and growth in the utilities sector. In terms of country, India is projected to lead the high-voltage switchgear market in Asia Pacific during the forecast period. This is primarily due to increase in non-renewable grid modernization and rise in investment in renewable energy. India is the second most attractive market for renewable energy investment. Countries such as China, Japan, and Australia are also expected to be significant markets for high-voltage switchgears. The high-voltage switchgear market in India is likely to expand at a CAGR of 6.5% from 2018 to 2026. North America and Europe accounted for combined market share of 47.2% in 2017. The research study includes profiles of leading companies operating in the global high-voltage switchgear market. Market players have been profiled in terms of attributes such as company overview, financial overview, business strategies, and recent developments. Key players in the global market include ABB Ltd., Eaton Corporation, Fuji Electric Co. Ltd., General Electric, Mitsubishi Electric Corporation., Schneider Electric SE, Siemens AG, Crompton Greaves Ltd., Hyosung Corporation, and Toshiba Corporation. Companies are focusing on expanding business through strategic acquisitions and partnerships with several end-use industries.